about table tennis and helping people connect to one another through play? the drive and focus to stay updated on the latest Killerspin products, content, and messaging? to become part of a rapidly growing, mission-driven culture? The Killerspin Dealer Program is an exclusive network of national and international dealers and distributors who enjoy bringing high-end table tennis products into new markets (as much as we do)! As a leader in table tennis equipment and experiences, we pride ourselves on serving our dealers with the same world-class customer support and expert resources we provide to our clients every day. Are you ready to experience the perks of becoming a certified dealer? - Killerspin develops one-of-a-kind products that outperform the competition. - Killerspin is a leader in the table tennis market and continously provides world-class performance in every aspect of our offerings. - Killerspin dealers receive access to the latest, most innovative products across a variety of price points. - Highly customizable products and packages are available to meet the needs of all customers. - Exclusive discounts with price breaks at higher-volumes are available to select dealers. - Killerspin’s in-house Concierge Service makes customer support simple. Our experts are on hand to give feedback on anything ranging from product specifications to tournament rules to shipping and tracking updates. - Our automated order entry and fulfilment makes selling fast, easy, and transparent for you and your customers. Log in and place orders in minutes. See available inventory, manage existing orders, and review a summary of your order history all in one platform available to you 24/7. - Bulk ordering, drop-ship, and White Glove delivery & installation options are available. - Killerspin exists to connect people through table tennis. It brings families, friends, customers and employees together and is the sport of the digital generation. - Killerspin created the #UnPlugNPlay movement to encourage people to step away from electronic devices and connect with others through invigorating physical activity. We invite you to get out and play today! Killerspin builds quality, long-term partnerships with world-class dealers across the globe. "We've had a great experience working with Killerspin. The design and quality of their products differentiates them from other brands in the market. Killerspin is a great partner, but most importantly, our customers love their products! We truly appreciate companies that allow us to represent their products along with supporting our amazing cause. This is a win-win relationship for sure." 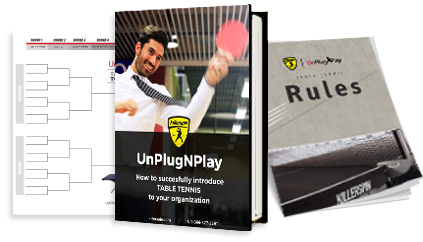 "Killerspin has been a reliable partner on the Megaspin platform for us for over 12 years, always standing behind their products and supporting us in our shared goal of bringing table tennis to more homes and offices." Interested in becoming a Killerspin Dealer? Are you ready to join the Killerspin Revolution? Let’s put a paddle in every hand, together. Complete the form below and we will reach out with more information about our program and next steps for qualification.